These extensions provide information on a path. Adds CAD-style dimension arrows to an object. In v0.47, this extension only works on paths; in v0.48, it also works on Shapes and Groups. It uses an object's bounding box to determine placement of arrows. 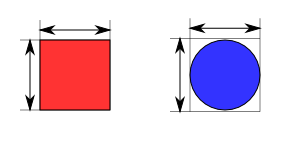 The arrows and original object are placed inside a Group. Two examples of using the Dimensions Extension. In v0.47, the square must be converted to a path prior to applying the extension. This extension draws the handle lines that one would see if editing the nodes of a path. It would be of more use if it included the drawing of the handle and node symbols. A spiral whose path length has been measured using the Measure Path extension. 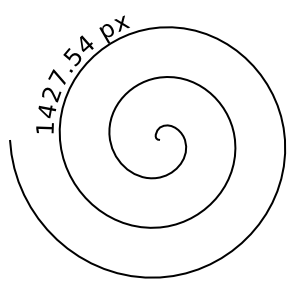 The length of the spiral's path is printed alongside the path. Default options except for Font size, which was set to 24 px. This extension numbers the nodes of a path. It is useful for creating an old-fashioned Connect-the-Dots puzzle. (It is also an example of how to access the path data in an SVG file for writing your own extension.) 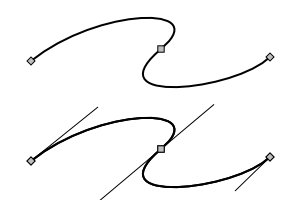 The original path is turned into a path with no stroke but with dot markers. The dots are then numbered. The size of the numbers and the size of the dot markers can be specified. 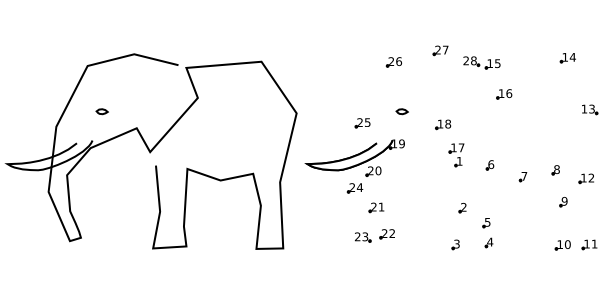 Left: Crude drawing of an elephant. Right: After using Number Nodes extension. The positions of some of the numbers have been manually adjusted to remove overlapping. Disclaimer: The use of an elephant should not be construed as an endorsement by the author or publisher of any political organization associated with elephants.